Over the last seven years, I've had so many letters and comments with compliments about this macaroni and cheese, so much so, that it's become a holiday tradition for a lot of Deep South Dish readers, sometimes replacing long-held family holiday recipes. You couldn't ask for a better compliment than that! I don't make the big batch version often, because it's such a huge casserole, and also what I would consider a no-calorie-left-behind dish, both reasons that it's mostly reserved for major holidays - like Thanksgiving and Christmas. Still, many of you have grown to love it, and have asked me to pare down the holiday recipe, not only because one 4-quart baking dish full is often plenty enough for many families, but also, you wanted a version of it for those other special family occasions - like birthdays and dinner parties, or potlucks, picnics, church suppers and even funerals, where you still want something special, but don't need quite as much as the big batch recipe makes. To distinguish it from the original big brother, I've labeled this one "super creamy" because that's just what it is - rich, gooey and super creamy - the way, at least in my opinion, a macaroni and cheese is supposed to be. Yes, that requires a processed cheese to achieve (even Martha Stewart agrees), so if you've got a beef with American cheese or Velveeta, then this isn't the recipe for you. For all that is holy, please don't try to use all cheddar, because you'll end up with a clumpy, curdled mess that you will be very unhappy about. Don't deviate from the recipe and you'll be thrilled. The process is the same and the same rules apply. Use only the original version of Velveeta brand processed cheese - no generics, no lower fat varieties. Use half and half or whole milk, not low fat or fat free. Use real, pure butter - not margarine, not a butter substitute - and I highly recommend Land O'Lakes brand especially. Use only block cheese that you shred yourself. Pre-shredded bagged cheese has fillers and stablizers in it that will affect the outcome of this recipe. Use sharp cheddar, not mild. 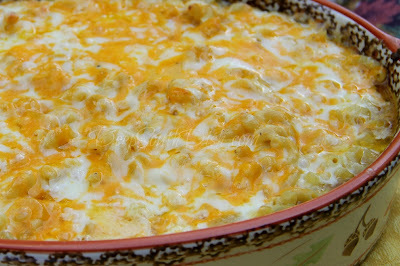 Make the cheese sauce with half and half or whole milk (or even a combination of the two) and Velveeta, temper the eggs with the sauce before adding that back into the sauce, then layer in the components in a 4 quart casserole dish - elbows, seasoning, thin slices of cold butter, shredded cheese and sauce; repeat. Bake, dig in and savor the gooey, super creaminess! For more of my favorite pasta dishes, visit my page on Pinterest! Butter a 4 quart baking dish; set aside. Boil macaroni according to package directions, rinse and set aside to drain. 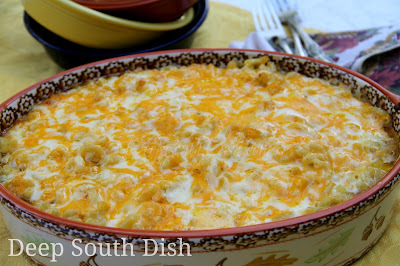 Preheat oven to 375 degrees F. Stir together the shredded cheeses and set aside. Pour half and half or milk into a medium saucepan, add Velveeta and cook over medium low heat until all of the cheese has melted. Remove from the heat and set aside. Crack eggs into a separate bowl and lightly whisk. Scoop out some of the cheese sauce and slowly add that to the eggs to temper them, continuously whisking as you add the hot cheese sauce to the eggs. Once eggs are well tempered, add them to the cheese sauce and whisk together until well mixed. Mix together the salt, pepper and Cajun seasoning, if using. Layer half of the noodles in the baking pan and season with half of the salt and pepper mixture. Slice thin layers of half of the cold butter and spread them around on top of the noodles. Sprinkle 1/2 of the cheddar/jack cheese combo over the noodles. Ladle 1/2 of the Velveeta cheese sauce over that. Repeat the layers of noodles, seasoning, butter and Velveeta sauce, except reserve remaining cheese for later. Bake at 375 degrees F, uncovered, for 20 minutes, remove from oven, top with remaining cheese and return to the oven for another 10 to 15 minutes, or until bubbly and lightly browned on top. Make Ahead Tips: I do not recommend assembling macaroni and cheese ahead as the pasta tends to absorb the sauce, giving a dry result after baking. What I do is to prepare the macaroni ahead, rinse and drain well, then store in a sealed container in the refrigerator. I also shred the cheese ahead, loosely bag and refrigerate. The cheese sauce may also be made ahead and rewarmed on low, however I find it just as quick to make that fresh when I assemble and bake the casserole. 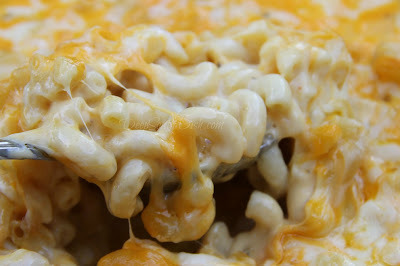 Hello Mary ...I made this version of your Mac and cheese for my grandkids over the weekend and it was a big hit! I made it as a side dish, but it was the main dish as they mostly avoided everything else on the table! I just bought your recipe book ( Deep South Dish ) at my local Barns and Noble bookstore yesterday as I did not want to wait to receive it in the mail if I ordered it on line! I got the last one in stock! I looked it over last night and I don't know what to make first....what a great collection of recipes! I will be buying another one for my daughter in law's birthday. Thank you so much!! I wanted the cookbook to honor the family here so I included some of the most popular recipes as well as what I consider to be classic Southern favorites. I am so happy you are enjoying it and thank you SO much for letting me know and especially for sharing that about your grandkids. HUGS!!! 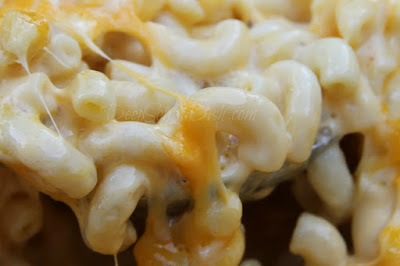 Looks and sounds delicious - creamy and gooey is the way I like my mac & cheese. I am going to make this one this week. Love macaroni and cheese, and your recipe sounds delicious! I hope you like it - let me know!! Mary, I can't wait to make this recipe. So glad I found you online. You were so cute in the QVC video with David. :-) Thank you for sharing your yummy recipes! Thank you Valerie! David made it easy I'm tellin' ya! I don't use much Velveeta at all but I absolutely have to have some in my mac and cheese. This recipe sounds and looks out of this world creamy and delicious. Mary, I made this tonight and it was wonderful. Also tried your meatloaf and even your sweet tea method this weekend. Delish. Am loving your cookbook. Thank you so much! I've even been inspired to try biscuits... again!!!! I can never consistently get them just right. Thank you so much Christa!! I've been wanting to make this for a long time. I finally made it the other night and now I'm kicking myself for waiting so long to make it! It was so creamy and good, we had a bit leftover and when reheated it was still super creamy! I will be making this again for sure. Thanks for all your delicious recipes. You're very welcome Bonnie - I'm so glad that you finally took the plunge! Made this Southern Style Mac and Cheese, along with our Christmas ham dinner. All I can say is that it was wonderful! Highlight of the meal! Now I must go back to my diet tomorrow! Thanks for a great recipe! Thanks so much Jenn & I hope you find some more goodies to enjoy!! Has this ever been tried in a crock pot??? No, I have not tried this recipe in the slow cooker. I've tried writing several mac & cheese recipes for the crockpot and I've not been happy with a single one of them so far. Seeing as it's not exactly an inexpensive venture, I'm not sure how much more I'll experiment! I always recommend making a recipe exactly as written the first time you make it, then if you decide to experiment with the slow cooker, you'll have something to compare it to. Please let us know if you give it a try!